New Release! from Zeromoon records, USA. 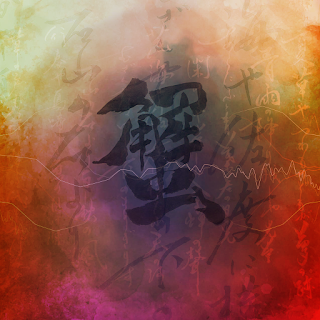 This new experimental album "Zuwaigani" consists of field recordings from Japan, Harp, Synth and Spoken Words. You'll get to hear my recording from the summer in Japan in 2015, a Carmac 34 strings lever harp being played by me experimentally, some poems in made-up language & Japanese & English read by me, other poems by Basho Matsuo "Okuno-Hosomichi" on the last track. Cover design by a calligrapher Juju Kurihara (the master of the Sosekido ) and a graphic designer @is_marigrafica. Radio Appearance at Sound Projector. Also a compilation from ADAADAT, TRADE & DISTRIBUTION ALMANAC - Volume Four . "Another fine package from Kayaka, the Japanese creator whose delightful, distinctive and good-humoured work has endeared itself to use since 2011 and a run of obscure CDRs, some of them featuring her bass clarinet playing but most of them exhibiting her cut-and-paste skills in constructing new music out of old records, samples, and effects. Her new release has found a home on the London-based Adaadat label, one of the primary sources for imaginative weirdness and quirked-out genius in the UK just now. The nine tracks on Sonic Kitchen (ADAADAT ADA0040) were created in Berlin in 2013, and once again Kaya Kamijo produces a dense, foggy quagmire of overlaid sounds, adding as many layers and rhythms as she thinks she can get away with, before the production collapses under the weight of its own varnish. If indeed she was a cook in a “Sonic Kitchen”, she’d be the kind of baker who can produce an iced cake 30 feet high and covered with filigree icing, producing an impossibly tall and spindly balletic sculpture that apparently defies gravity. Or she’d build a replica of the Brooklyn bridge out of Porterhouse steaks, that you can only eat using a lawnmower. Either way I’d like to think she would serve something more imaginative and appetising than the split hot-dog sausage that appears on the cover. All of these tunes proceed with the easy-going, walking-pace rhythm that I describe as a “clonking” beat – the opposite of high-speed Techno music or the like, and certainly Kayaka exhibits zero interest in a slick dancefloor production when she prefers calling attention to the mechanics of how each song is assembled. This strategy allows the listener a degree of instant familiarity and comfort, before we’re led gently into the realms of the surreal and the bizarre, as each new unlikely musical element is ushered in, doing battle with spoken-word samples or excerpts from movies. We’re required to follow at least three or more lines of continuous information – a good exercise for the noggin. This time around, one key note or recurring theme appears to be a nostalgia for the past, expressed as old 78 RPM records, including cabaret songs, classical music, and dance music, all cleverly repurposed so as to instantly transcend cliché. "The lead track on Sonic Kitchen (Adaadat), “Dream”, is a minimal mix of looping organ, glitch percussion and electronic pulse. Beat-centric pop music, it seems pretty straightforward. Then it gears up, and other elements, including atmospheric keyboard abstractions, and long saxophone and piano solo samples, are dropped in according to effective if as-yet inscrutable logic. When “Dream” ends and a jaunty vintage dance sample introduces “Pickled Tango”, the co-ordinates seem pretty obvious: electronica and sampling; play made with stark contrasts; see also: Solex and/or Mr Scruff. But hang on, that piercing whine of feedback is unexpected, and persistent. Soon the tango stops and its just that fluctuating feedback with some recorded footfall mixed in, and some muffled crackling sounds that could be shavings from the Bohman Brothers’ “hard-wired flea market“. KAYAKA is Kaya Kamijo, a Tokyo-born, Berlin- and London-based composer and multi-instrumentalist. Her bio say’s she was “self educated, apart from piano lessons and brass band practices when she was a child”, and that her live sets are “mostly” improvised. That fits. Perhaps the rhapsodic piano on this track is KAYAKA? The title “Hungarian Rhapsodist” suggests otherwise. But the other, less placeable, foley-style sounds are surely original. The juxtaposition of the lyrical and the makeshift is nicely done. Nothing here is crass-sounding or laid on too thick. It’s kitschy, but lucid. Franz Liszt yes; Brahms and Liszt, certainly not. There’s more lyrical piano on “tropic of cancer”, trinkle-tinkling through the mechanical rhythmics of actual-sounding machinery. The lovely “Who Knows Amelia” repeats the trick with looping percussion and a plaintive Arabic vocal. By simple surrealist montage strategies, a helpful third layer of sampled talk helpfully suggests, “the music develops cohesion”. “Piper’s Rats” is a hit of wonky instrumental pop, with a lyric courtesy of a sampled Dagmar Krause singing Kurt Weill’s “Surabaya Johnny”. "I was also left with a splitting headache and (hopefully) temporary tinnitus that manifested itself this morning and hasn’t quite gone away yet. Coincidentally, Today’s New Band, Kayaka, sounds like the inside of my head, yet better. Kayaka makes noise, unapologetically and insistently, but noise that, in terms of construction at least, is vaguely reminiscent of that other band who will be gigging old material soon, My Bloody Valentine.